Last Saturday was small business Saturday and Amex was running this pretty sweet promotion where if you signed up and spent $25 at a small business, they would give you a $25 credit. I immediately thought, “free yarn!” Yipee!! On top of that, my local yarn store had a “make your own sale” that day. Basically, you got to pick a poker chip out of a pot and get the equivalent discount off your purchase (including clearance items). So I set out to the yarn store with a list of yarn I needed to make this cardigan I’ve had my eye on for ages. I did end up finding the yarn I needed for that project (which I wont start until after Christmas), but I also wound up checking out the clearance bin and found some super soft red and white Alpaca and Merino blend yarn. It was a steal with both discounts, so I decided I’d make little man a Santa hat with it. In case anybody out there needs a Santa hat pattern that will fit a toddler (18-24 months…maybe beyond that given how stretchy it is), I’m posting the pattern here for you to use and enjoy too. Please bear with me if there are differences from how patterns are normally written. I’m new to this, and also just learning how to read patterns in English (I have always used French patterns until recently). CO 60 sts in CC. Place marker and join the round. 6 sts remain. Tie off by using a tapestry needle to thread through remaining sts. Attach pom pom. 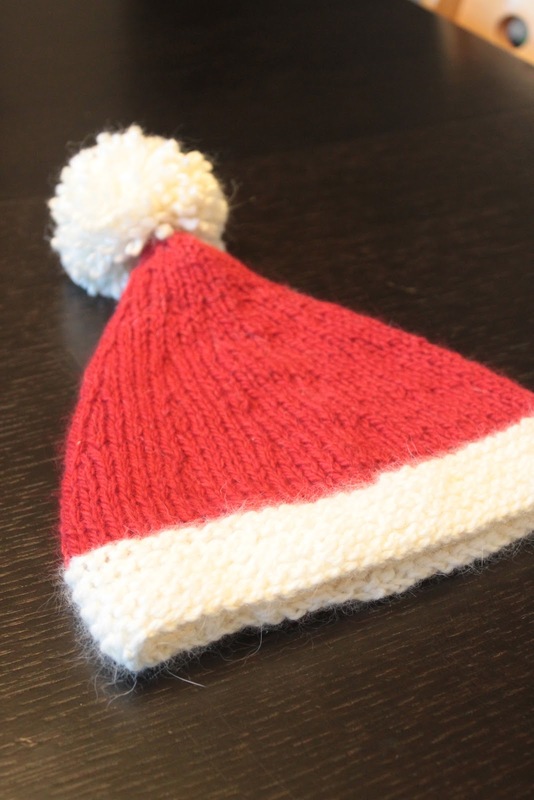 This entry was posted in holiday, kiddo, knitting, pattern on November 27, 2012 by seedsowingmama. Last week was a busy week. Little man, my mom and I went to gather chestnuts, I got the house ready to host Thanksgiving dinner, cooked (and enjoyed) said Thanksgiving dinner, and then enjoyed the long weekend as a family. I promise to post pictures of the chestnut excursion soon, but for now, here is a synopsis of our Thanksgiving (Little man’s first as a solid-food-eating child!). I made roasted brussel sprouts, based on this recipe by Ina Garten. Since I only have one oven and I didn’t want the turkey to rest for 45 minutes and get cold while the brussel sprouts were roasting, I par boiled them for about 3 minutes and then plunged them in ice water before roasting them. Here they are on the jelly roll pan, tossed with olive oil and salt. Ready to be roasted. My mom made the chestnuts, freshly gathered, then boiled and peeled. 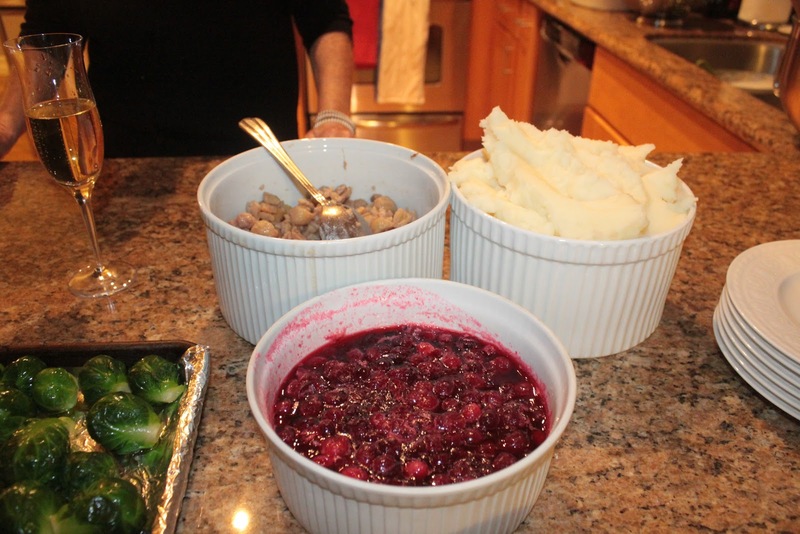 She also made the cranberry sauce because it’s her specialty. I made the mashed potatoes, below. I didn’t get a picture of the yams on their own, but they turned out really good! I peeled and sliced them. Then in a small saucepan I combined 2/3 c. chicken stock, 2/3 c. apple cider, 2 Tbsp brown sugar, 4 cloves of garlic (minced), and some salt and pepper. Then I brought all these to a boil until the sugar had dissolved and poured it over the yams, arranged in a baking dish. I baked them at 375 for about 30 minutes, covered in foil. 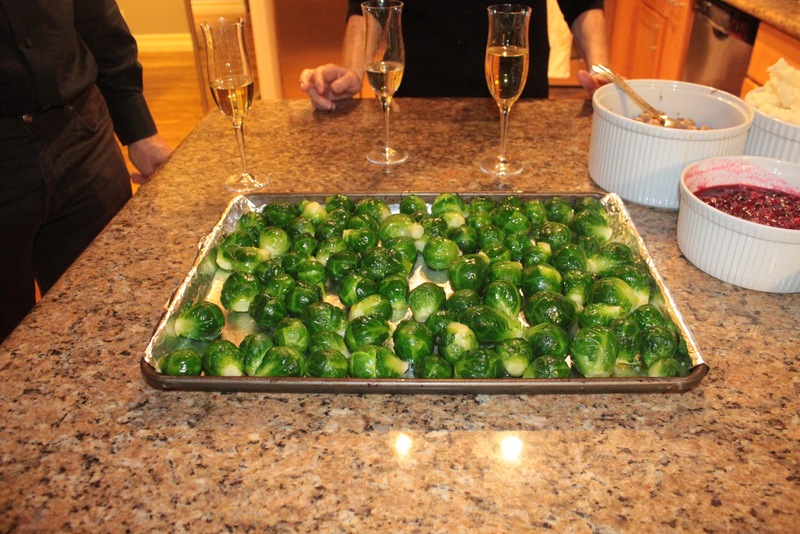 Then I set them aside until after the turkey was cooked and put them back in the oven for 20 minutes of so with the brussel sprouts. Everything turned out as I’d hoped. Yay! Of course, dessert was involved. I made an apple pie and a pumpkin pie. Unfortunately, no picture of the apple pie was taken before cutting into it and now it’s long gone. 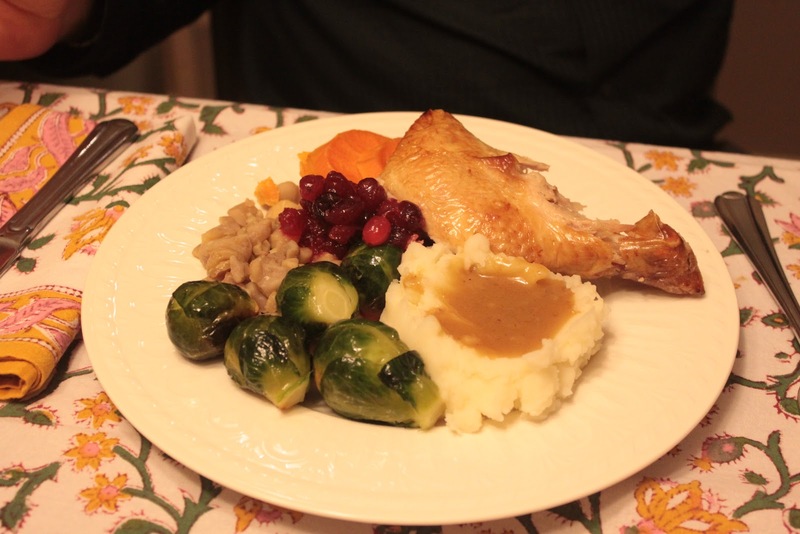 It was tasty though, thanks to my North Carolina uncle who shared his recipe with me. I used a new recipe for the pumpkin pie and was kind of disappointed. 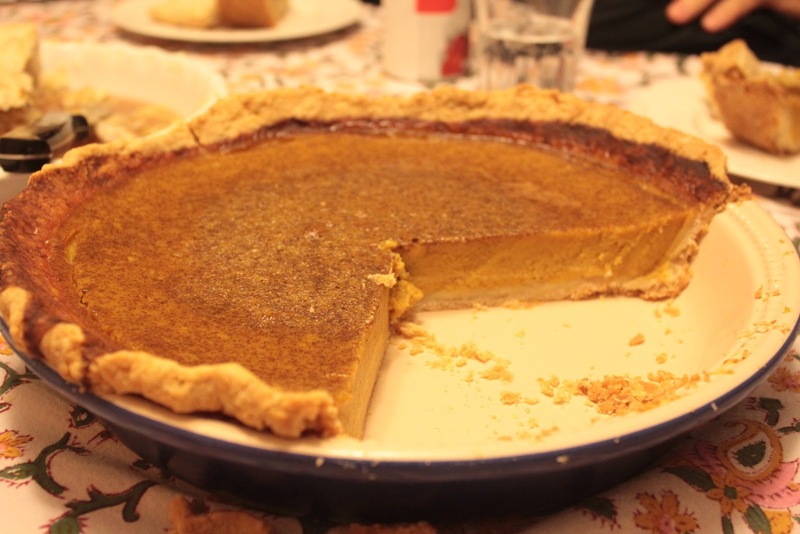 I usually use the Classic Pumpkin Pie recipe from Martha Stewart and it’s always turned out great. I’m not sure why I decided to change it up, but I’ll be going back to my tried and true one next year. This entry was posted in american cuisine, holiday, recap, recipe on November 27, 2012 by seedsowingmama. The recipe for the pulled pork spice rub was sent to me by my aunt from The Joy of Cooking, which I’ve adapted a bit. The recipe for the BBQ sauce is my own. I’ve been tweaking it over the years and have pretty much perfected it, in my opinion. It always gets rave reviews, so now I am sharing it with you. Just a note, I like my BBQ sauce tangy and not so much on the sweet side. I’m told this is Texas style BBQ. If you prefer a sweeter BBQ sauce, you may need to make adjustments. If you do make it, let me know what you think and if you changed it to suit your tastes. Combine all of the ingredients in a bowl and stir it all up. I like to double the recipe and keep it in my freezer to have spice rub at the ready when I need it. I also sometimes do half regular paprika and half smoked paprika to add some extra smokiness. 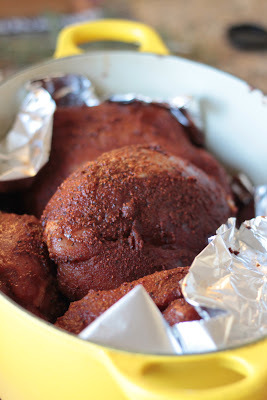 Once your spice rub is ready, it’s time to rub a generous amount of it on your pork. Did I mention the type of pork to use for this? Any sort of pork roast will do. I use pork shoulder, usually, but I’ve used loin before.Place a sheet of aluminum foil on the bottom of a dutch oven, and put your rubbed down pork on top. Cover it with the lid and keep it in the fridge for at least 4 hours (or overnight). Meanwhile, you can start making your BBQ sauce. Here is the recipe I’ve been tweaking over the years. I haven’t changed it in a while because we really like it this way, hence why I’m finally ready to share. 1. Heat a heavy bottomed pot over medium heat. Coat the bottom with olive oil and cook the onions until they begin to be translucent. Add the garlic and cook for about a minute, stirring the whole time. 2. Add the tomato sauce and tomato paste. 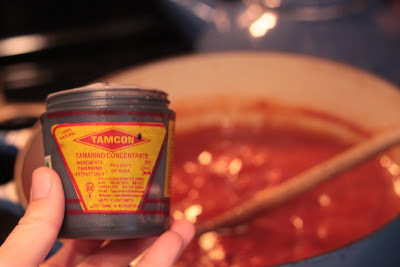 Stir well to incorporate tomato paste. 3. Add remaining ingredients. 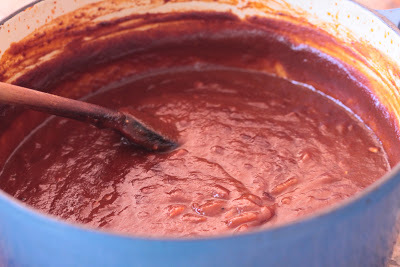 The tamarind paste and soy sauce are what really deepen the color of the BBQ sauce. See the shot above and the two below for comparison. 4. Let sauce simmer for 30 minutes or so. Taste for appropriate smokiness and spiciness often and add smoke or hot sauce as needed. 5. Back to the pork now. Preheat your oven to 325. Take the pork out of the dutch oven while you heat the dutch oven over medium heat. When the dutch oven is hot, coat the bottom with olive oil and sear the outside of the the pork until it’s evenly brown. 6. Put all the pork back into the dutch oven, cover it with the lid, and roast it in the oven for 3 1/2 hours. 7. 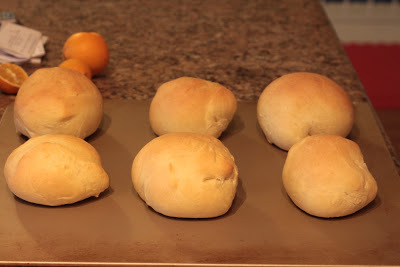 While the pork is roasting, you can make hamburger buns if you really want to go all out. 8. When the pork is done, remove it from the oven, allow to cool slightly and shred with a fork, or your fingers if you can stand the heat. 9. 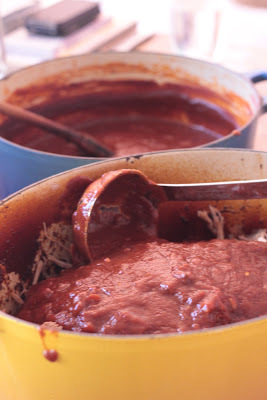 Spoon BBQ sauce over the shredded pork and serve with hamburger buns. 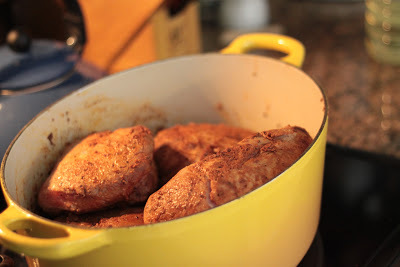 This entry was posted in Food and tagged dutch oven, Fall, pork, Recipe, Winter on November 19, 2012 by seedsowingmama. There’s nothing cozier to me than a pair of slippers when you’re home on a cool day. (Well, maybe a pair of slippers, good book and a fire would be even cozier, but you get the point). Little man didn’t have any slippers, only socks. 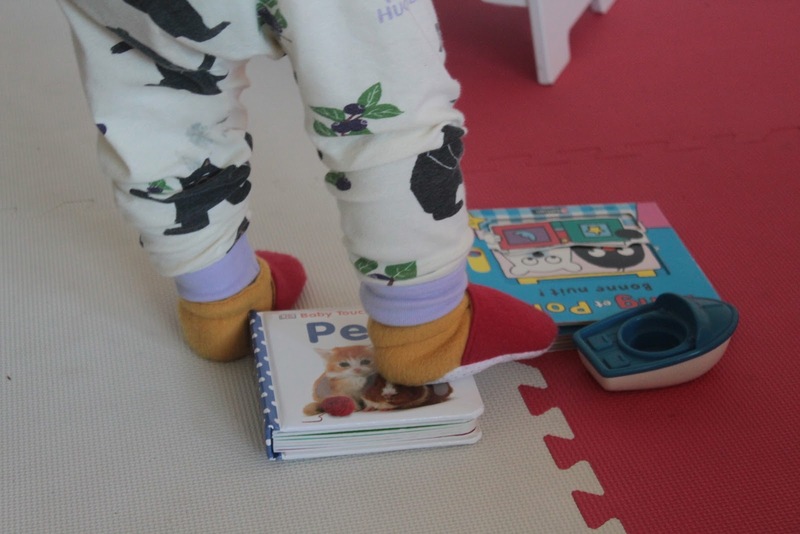 But most of his socks aren’t non-slip, so when wearing socks he’d just slip and slide around the house- falling even more than he normally would without any socks on. Something needed to be done so that he could have warm feet without all the falls. 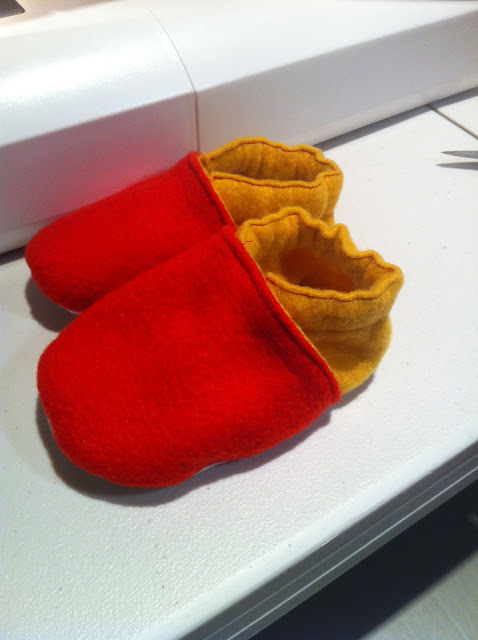 So, I set out to make him some slippers. I used some non-slip fabric that I found at Jo-Ann. I believe I spent $3 on enough of this stuff to make slippers for years to come (and I only bought 1/4 yard). For the rest of it, I used scraps of fleece and some 1/4 inch elastic that I already had. 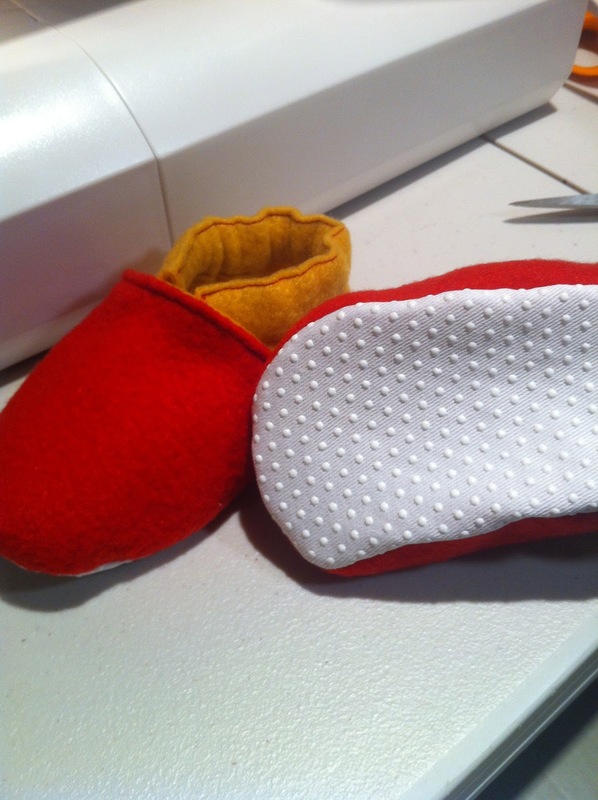 For the pattern, I adapted it from a pair of soft soled shoes that currently fit him. I was able to get these done start to finish (making the pattern and all) in a couple hours. Now I’m going to make him a few more pairs in different colors for when these ones are in the wash. If there’s enough interest, I can do a tutorial for how to make these. Let me know in the comments if you’d like that. 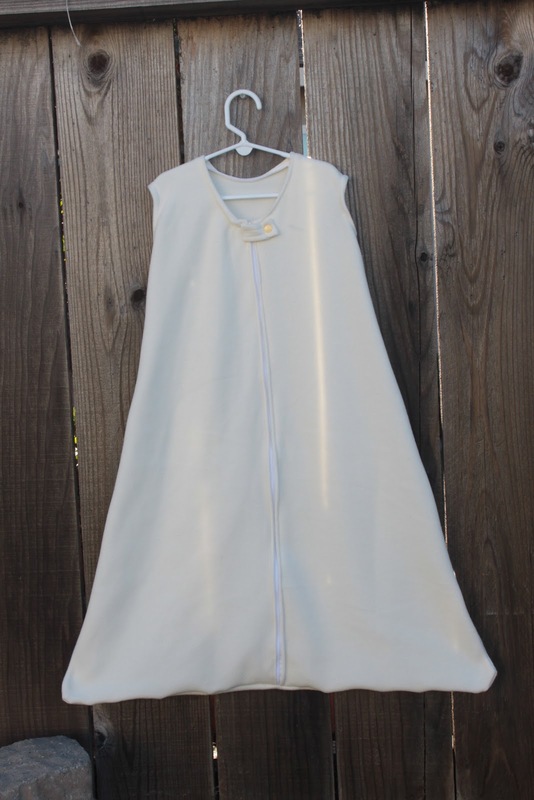 This entry was posted in DIY project, kiddo, sewing on November 17, 2012 by seedsowingmama. When I was young, my parents started a lovely tradition of giving me a new ornament every year to commemorate something special or memorable about that year. One year, it was a ballerina another year a piano. When I turned 16 it was a car and when I turned 21 it was a bottle of wine and so on a so forth. I think it’s such a sweet tradition and I plan to continue it for our family. So, one of the big things that happened this year for us was getting our chickens. Raising chickens for eggs is something I’ve wanted to do for years and I’m so so excited to have them! 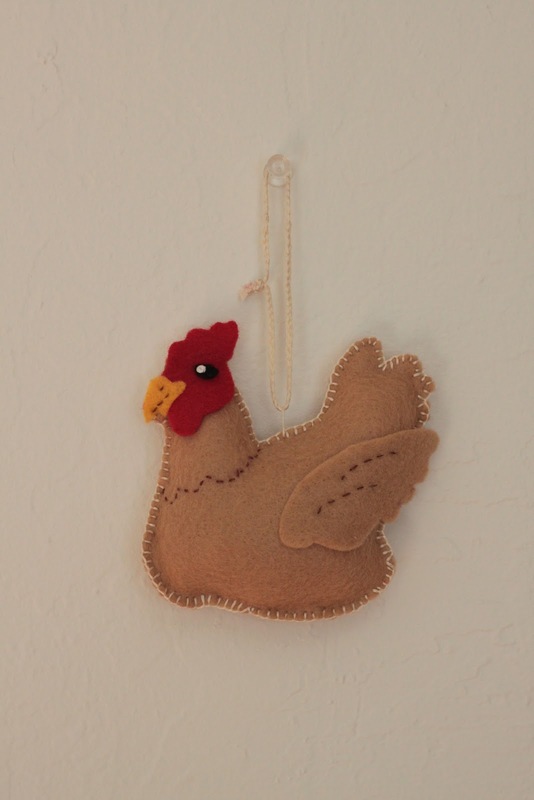 What better way to commemorate this year than with a chicken ornament? I found the pattern over at Down East Thunder Farm. 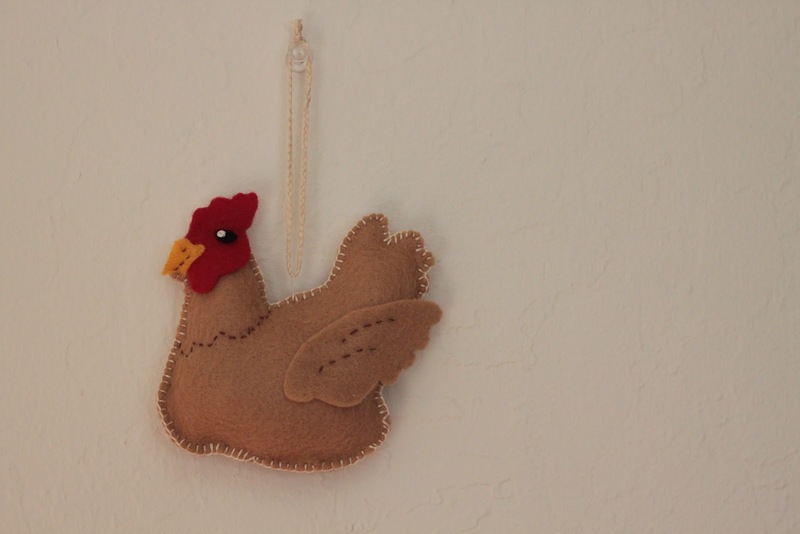 The pattern is free, along with many other patterns for felt bird ornaments. They’re beautiful and I plan on making some more felt birds to decorate our tree and to give as gifts. Be sure to check out this blog if you’re into making felt ornaments. This entry was posted in DIY project, holiday, sewing on November 15, 2012 by seedsowingmama. So at this point you might be getting tired of seeing my creations sewn with the Heidi and Finn Urban Hoodie pattern (I swear, I don’t get paid to promote her pattern here). 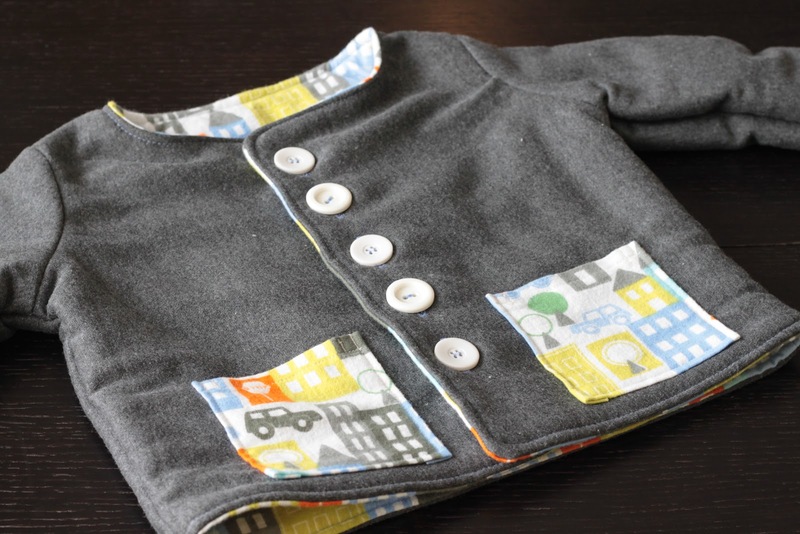 This time, though, I adapted it and made a jacket for little man. For the sleeves, I used a smaller seam allowance than the pattern recommends. I’ve found the sleeves on this pattern to be very tight, so I think I’ll be doing this for the sleeves from here on out when I use this pattern. I also added pockets to the front. 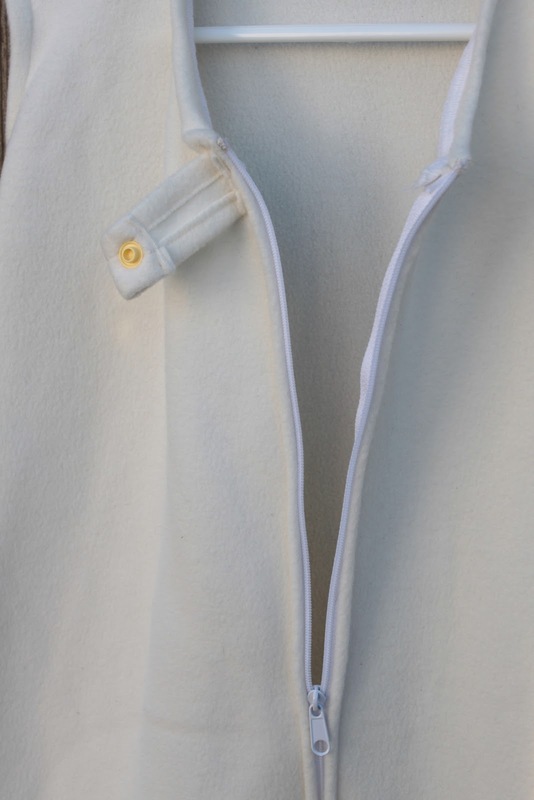 And finally, to make sure it’s nice and warm for the winter, I put cotton batting in between the main fabric and the lining. Oh, one more thing- normally the neck curves up a bit. Can you see what I mean in the picture below? I love how it turned out! He gets lots of compliments on his jacket when we’re out and about running errands. Perfect for playing outside on a cool day. 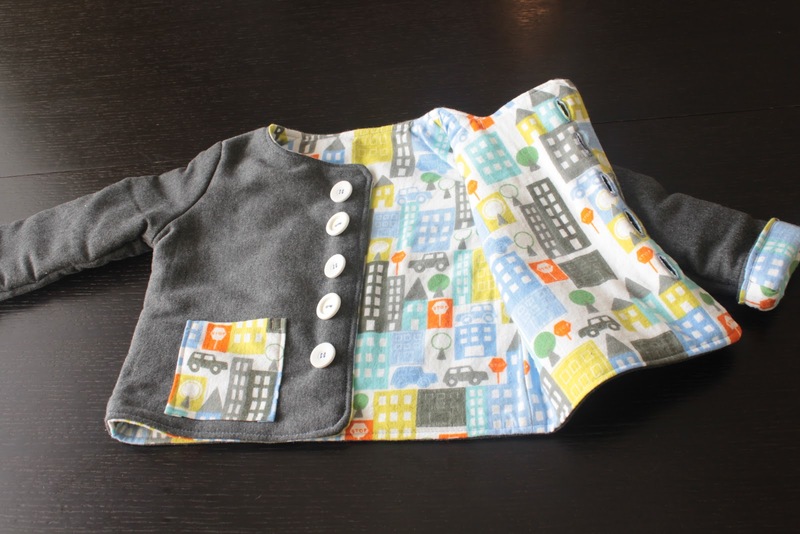 This entry was posted in DIY project, kiddo, sewing on November 14, 2012 by seedsowingmama. The weather has officially cooled down here (and by that I mean it’s in the 50s during the day and 40s at night). Little man has a nice and warm lined jersey and cotton batting sleep sack that we use for nighttime, but he needed an upgrade from his single layer jersey sleep sack for naps. Plus, he was definitely getting too tall for the size we had. I decided that a sleep sack looked easy enough to replicate and I didn’t really want to buy another one. So, I used one of the sleep sacks we had to make a pattern, extended the length and used some fleece I got from a freecycler. 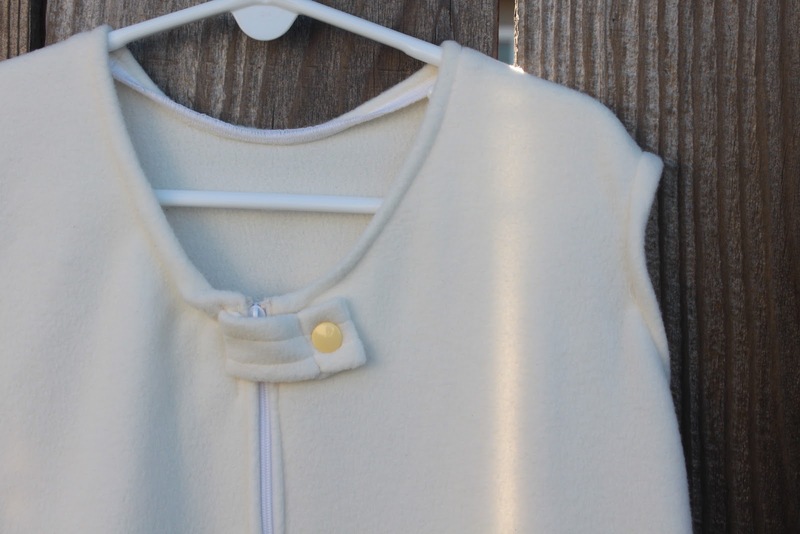 The only thing I had to buy was some zipper by the yard, which I found on Etsy (and later discovered I could get at a local fabric store without paying shipping…next time). 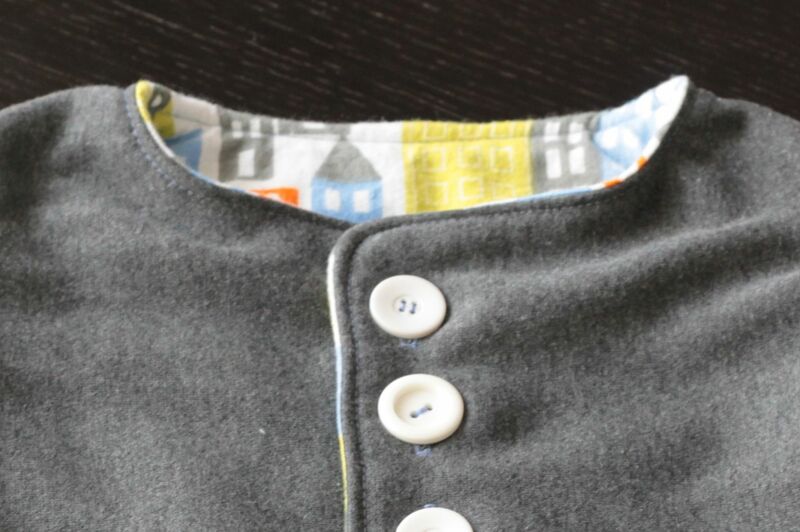 The zipper goes from top to bottom, unlike commercial sleep sacks, so I put a little tag of fabric over the zipper closure to keep little man from being able to mess with it and to avoid it irritating his skin. It turned out great and for about $3.50 (the price of the zipper with shipping), definitely saved me money to make it myself. I have another yard of zipper, and I’m planning on making another sleep sack soon. If there’s enough interest, I’ll take pictures while I’m making the second one and post a tutorial. 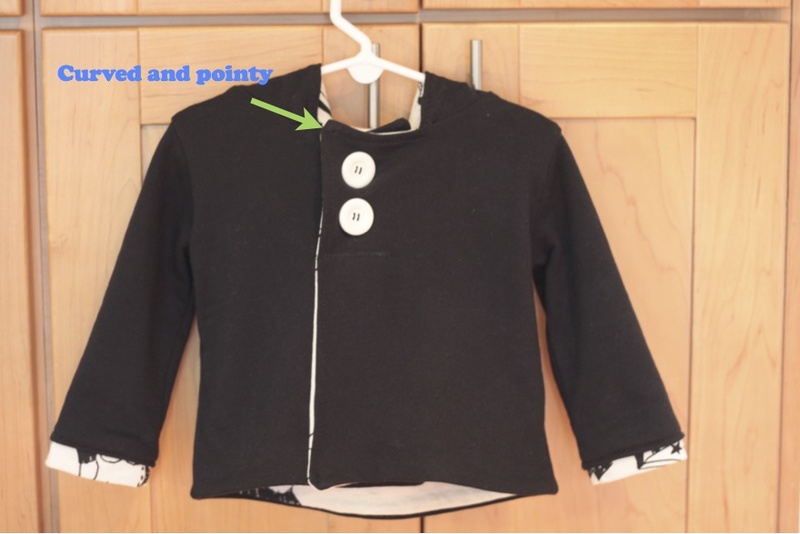 This entry was posted in DIY project, kiddo, sewing on November 12, 2012 by seedsowingmama.